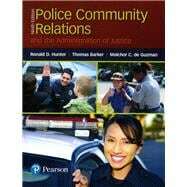 by Hunter, Ronald D.; Barker, Thomas D; de Guzman, Melchor C.
Police-Community Relations and the Administration of Justice, Ninth Edition, continues the theme of citizen participation, emphasizes why it is critical to the effectiveness of the criminal justice system, and addresses the dynamic nature of police-community relations. The book focuses on the importance of and strategies for positive police-community interactions and addresses the internal and external communities the police serve. The text's interdisciplinary approach draws data and discussions from a wide range of disciplines and gives students a well-rounded perspective to help them better understand and practice positive police-community relations. The Ninth Edition includes updated data and references throughout; new ideas for addressing the ongoing changes in police-community relations; new insights on how the police organization fits with the community it serves; enhanced information on the dynamics of policing realities; a look at the different levels of communication and how to improve communications; the relationships between the media and the police; and more. Dr. Ron Hunter holds the rank of Professor and founded the Criminal Justice and Criminology program at Georgia Gwinnett College. He received his Ph.D. in Criminology from Florida State University. He previously taught at Western Carolina University, the University of West Georgia, Jacksonville State University, and the University of North Carolina at Charlotte. He has held administrative positions of program coordinator, department head, and associate dean. Prior to entering academia Dr. Hunter was a sergeant with the Tallahassee (Florida) Police Department. Assignments included supervising the joint Tallahassee-Leon County Robbery Task Force, the Managing Criminal Information Unit, the Career Criminal Unit, the Records Section and a squad of Officers within Uniformed Patrol. He also served seven years as a part-time Municipal Judge in Cave Spring, Georgia. Dr. Hunter is a Past President of the Southern Criminal Justice Association and of the Academy of Criminal Justice Sciences. His research interests are primarily in the areas of crime prevention and law enforcement. He has published textbooks on research methods, criminological theories, robbery prevention, and police-community relations. He has published articles and presented numerous papers on a myriad of criminal justice issues. Dr. Thomas “Tom” Barker, Professor Emeritus, School of Justice Studies from Eastern Kentucky University, has been busy since his “retirement” from teaching and moving to San Antonio, Texas in December 2013 to be close to his granddaughter. He has revised two books on Outlaw Motorcycle Gangs and North American Criminal Gangs and published another book on Biker Gangs. He has completed a book on Police Sexual Misconduct currently being reviewed for publication, and is researching and writing a book, Outlaw Bikers Legacy of Violence: Altamont to Waco, Texas. He has published an article on the Massacre at Waco—police biker shootout and the overreaction by the police. He has presented three papers at professional meetings on police misconduct and outlaw bikers and filmed a narrative for the Las Vegas Mob Museum on their Outlaw Biker display. Melchor C. de Guzman is a professor of Criminal Justice and Criminology at Georgia Gwinnett College. He earned his doctorate degree in criminal justice from the University of Cincinnati with concentration on policing in 2001. He has extensive experiences working in the criminal justice field in the U.S. and the Philippines. Dr. de Guzman was a police instructor for middle managers and senior police officials as a lecturer with the Philippine Public Safety College. He had also formulated policies for the Philippine National Police as the Secretary of the Senate Committee on National Defense and Security in the Philippines. He has worked with the evaluation of community policing in South Bend, Indiana and the shoplifting phenomenon in Cheektowaga, NY with the Cheektowaga Police Department. Dr. de Guzman’s research includes the examination of citizen participation in the control of the police. He also investigates organizational and environmental factors that influence police behavior. He has published two edited books examining international policing practices. He has also published several articles in policing journals. His most recent research includes the utilization of websites by police departments in the delivery of police services, the implementation of policing models, and the role of the police in homeland security. Dr. de Guzman is currently involved in a National Science Foundation (NSF) grant investigating insider threats in financial institutions. He is also the current managing editor of Police Practice and Research: An International Journal and the book editor for the International Police Executive Symposium. Dr. de Guzman can be contacted through email at mdeguzman@ggc.edu or by phone at 470-217-5512.